Special Handling: Glass, Marble, Mirrors, Over-sized items, etc. When your moving truck arrives at our warehouse, empty vaults are taken directly to the truck doors with a forklift. The items are already wrapped and protected which facilitates fast loading of the vaults. 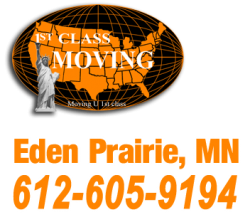 1St Class Moving storage facility is a private warehouse. When the time comes to deliver your furniture to your new location, We load your goods directly to the truck. Large, soft items, such as sofas and overstuffed chairs, are shrink-wrapped then stored on custom couch racks. Glass, marble, large mirrors etc., are stored on special shelves.